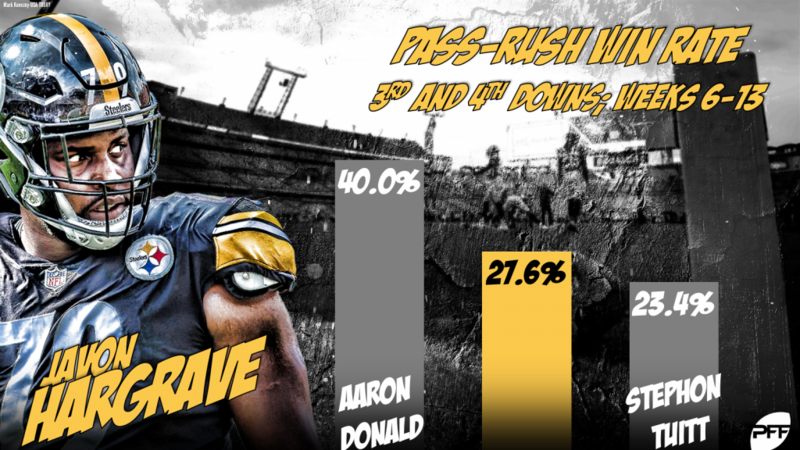 Just over two weeks ago, we highlighted the rapid ascent of Pittsburgh Steelers’ Javon Hargrave and his stellar play in Weeks 6-11, and the big man hasn’t let us down since. Adding 80.5 and 79.3 single-game pass-rush grades in Weeks 12 & 13, respectively; Hargrave has gone from a flashy riser to proven commodity over the last eight weeks. The former South Carolina State third-rounder has earned an impressive 89.8 overall grade in Weeks 6-13, which ranks seventh among the 71 interior defensive linemen with 200-pus defensive snaps in the eight-week span. His 80.9 pass-rush grade and 79.6 run-defense grade rank seventh and 16th, respectively, among the same group, as well. Hargrave may have just 16 pressures in Weeks 6-13, but his pass-rush win rate (16.7) and pressure rate (14.0) rank fifth and fourth among the 79 at his position with 100-plus pass-rush snaps in that span. He’s recorded a pressure or beaten the opposing offensive lineman on 19 of his 114 pass-rush snaps, picking up 10 hurries, one hit and five sacks in the process. Rushing the passer on third and fourth downs, Hargrave totaled seven pressures across 29 pass-rush snaps in Weeks 6-13. His 27.6 win rate and 24.1 pressure rate ranked second behind just Los Angeles Rams’ Aaron Donald among the 60 interior defensive linemen with 25-plus pass-rush snaps on third or fourth down in that time. Unlike a lot of guys with his size (6-foot-2, 305 pounds) playing inside the guards in the NFL, Hargrave is no slouch against the run. His 15.7 run-stop percentage in Weeks 6-13 ranks fifth among qualifiers, placing him among the likes of Damon Harrison (21.1), Donald (19.5), Akiem Hicks (16.3) and Chris Jones (16.2). He also ranks 13th in percentage of run-defense snaps he’s been the first to make contact with the ball carrier at 13.0%, another impressive figure for an interior defensive lineman of his size. Put simply, Hargrave is beating the man in front of him at an elite rate, and that high-end ability among interior defensive linemen is invaluable. Sacks and tackles are easy to come by regardless of one’s ability, but winning blocks with elite consistency takes legitimate talent often masked or hidden by box-score production or lack thereof.